He came to his own home, and his own people received him not (John 1:11). Bishop Basil Hopko, S.T.D. was born on April 21, 1904, in the village of Hrabske, on the border of the hilly district of Sharish, presently in Eastern Slovakia. His parents, Basil and Anna, were. He was hardly one year old when his father was struck by lightning and died. When he reached his fourth birthday his mother left him with her own family, while she departed to the United States in search of a better life for her and her son, intending that he would join her after she had established herself. Bishop Hopko received his primary and secondary education in Hungarian schools, and was graduated with honors from the Evangelical Gymnasium in Prjashev, 1923. Supported by his mother in America, he continued his education at the Eparchial Seminary in Prjashev. His mother had hoped that Bishop Basil Takach (1924-1948) would ordain him as a priest for the Pittsburgh Exarchate; however, her dreams were never realized. As the young Hopko was getting ready for his journey abroad he became sick and had to undergo several operations. In his Memoirs Bishop Hopko writes: "Having spent all my traveling money on doctors and hospitals, I gave up the hope of seeing my mother again. At that time I did not realize that it was God's holy will to keep me in my native land." He always ascribed his unexpected recovery to a miracle resulting from a Novena to the Sacred Heart of Jesus. He was ordained priest by Bishop Paul P. Gojdich, O.S.B.M. on February 3, 1929. After his ordination Father Hopko was appointed to organize a new parish in Prague -- at that time there were many Byzantine-Ruthenian Catholics among the government officials, soldiers, students and workers living in the capitol -- and Father Hopko started his missionary work with great zeal and dedication. In a short time he acquired the beautiful church of St. Clement, which since has become a spiritual center of the numerous Ruthenian Catholic faithful living in Bohemia. Eventually, he was joined by his mother who, after 22 years of hard work abroad returned to her native land to become her son's housekeeper. In his pastoral work Father Hopko displayed great love for the poor, especially the unemployed and students. During these years of economic depression, the Communists were eager to recruit religious people into their organizations by any means; but the watchful eye of Father Hopko frustrated their intentions. He was justly rewarded with the title of Monsignor in 1936, the practice of bestowing Roman honors on Eastern Catholic priests being popular at the time. In addition to his full schedule Father Hopko somehow managed to continue his theological formation at the famous Charles University, completing his last semester at Komensky University in Bratislava, where he earned a doctorate in Sacred Theology in 1940. At that time he was already teaching at the Eparchial Seminary in Prjashev. Unfortunately, in the midst of his fruitful pastoral and scholarly work, Monsignor Hopko became the victim of a malicious, ethnically motivated government campaign against Bishop Paul P. Gojdich, OSBM, during the Tiso regime (1939-1944). Eventually Monsignor Hopko was forced out of the Seminary and denied his salary. After World War II, when government pressure somewhat subsided, Monsignor Hopko was entrusted by Bishop Gojdich with the eparchial religious press, which had been completely banned under the Tiso regime. In 1946, he started the publication "Blahovistnik," which provided the faithful people with a yearly religious almanac, and supervised the publication of spiritual booklets, four of which he authored himself. Foreseeing political turn-over in Czechoslovakia, Bishop Gojdich petitioned the Holy See to appoint Monsignor Hopko his auxiliary; and his episcopal consecration took place at the cathedral in Prjashev, May 11, 1947. Bishop Hopko became the right hand of Bishop Gojdich in preparing his faithful for the imminent seizure of power by the Communists that came in February, 1948. The Communists began their anti-religious propaganda by maliciously attacking the Byzantine Catholic Church. On April 28, 1950, the authorities officially liquidated the Eparchy of Prjashev and imprisoned Bishop Hopko. For a time, he was kept in isolation, while the government pressured him to join the Orthodox Church; subsequently, they decided to put him on trial, accusing him of alleged "subversive activity." Transferred to the central investigatory prison in Ruzin near Prague, he was locked in a dark, solitary cell where he completely lost count of time, and where he was made to walk without rest for 122 consecutive days. During that period of time his diet consisted of a piece of stale bread and a glass of water. He wrote that his legs "became swollen like logs." Describing this ordeal, Bishop Hopko remarked: "In my mind I already began to envision my own funeral. But I kept praying for strength to persevere and to remain faithful to the Catholic Church." 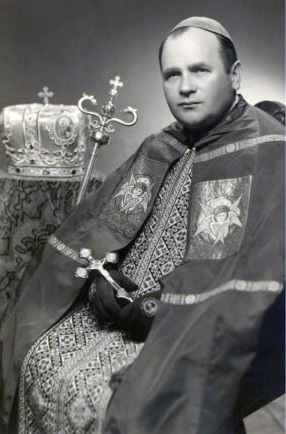 Bishop Hopko was brought to trial in the spring of 1952. Convicted of "subversive activity" and contacts with a "foreign powers" (i.e., the Apostolic See), he was sentenced to fifteen years in prison. Thus his "pilgrimage" from one prison to another began, seeing him transferred twenty-one times. Reminiscing on his prison days, Bishop Hopko wrote: "I had to endure many difficult moments. which I would not wish even on my worst enemies. Nevertheless, I consider my prison days as a higher education in humility. In prison I learned a great many things, as how to be of service to others in their need. Prison in itself is not such a terrible place after all. What is frightening is the company one is forced to keep, being locked up in the same cell with all kinds of criminals, spies, insane, and some other strange characters." Long years of prison life and harsh treatment by the prison guards finally undermined Bishop Hopko's health. He suffered acute mental depression, but the prison authorities refused him any medical assistance. Bishop Hopko, himself, admitted: "At that time everything looked very gloomy to me. I was unable to sleep, I lost my appetite, and suffered severe irregularity. I became only a shadow of a human being, hardly able to walk. I lost even the desire to live. Only my faith and prayers kept my mind sound. But finally the good Lord saved me from my indescribable distress." In the fall of 1943 Bishop Hopko suffered a particularly severe attack of depression, and was transferred to a special clinic in Prague. On the advice of his doctor, Bishop Hopko petitioned to be released from prison on account of his ill health. He was released in the summer of 1946, but he was not allowed to return home. Confined to a home for the aged in Osek, Bohemia, he remained under constant police surveillance. Of this period, he wrote, "I never had it so good, except when I was living with my mother. The most important thing is that here I have sufficient time for prayer and I am able to lead a truly spiritual life." Confined with him in Osek were about 160 elderly Sisters from various Czech, Slovak and Hungarian convents, confined there by the communist authorities. Bishop Hopko was happy to be able to extend spiritual assistance to them since he spoke all three languages fluently. His kindness and charity became known to all the Sisters, and they nicknamed him "Our Golden Man." In the spring of 1968, the communist policy under the leadership of Secretary Alexander Dubchek was liberalized, and the government agreed to restore the Byzantine Catholic Church. Bishop Hopko, as soon as he was released from his confinement in Osek, initiated the drive for the restoration of the Prjashev Eparchy; and on June 13, 1968, the eparchy became officially recognized. It was expected that Bishop Hopko would become the administrator of the restored eparchy, but as the necessary steps for Bishop Hopko's rehabilitation were being made, ethnic activists among the clergy conspired to replace Bishop Hopko with "a Slovak Bishop," and initiated a malicious campaign against him. Eventually, Bishop Hopko was removed from the administration of the Prjashev Eparchy; and in his final report to the Holy See as Administrator, Bishop Hopko wrote: "I have sufficient reason to believe that the Slovak members of the Acting Committee are attempting to remove me from the administration of the eparchy and to curtail my authority. I bow my head to God's will, since I want to remain loyal to the Holy See. But I am afraid that the people, when they find out what had happened, will be disturbed and cause some harm to the Church." His predictions were borne out as several parishes disenfranchised themselves from the eparchy, which remained without a bishop for many years following. As the end of Bishop Hopko's life was approaching, he kept repeating: "I want to go home!" When the attending Sisters pointed out to him that he was home, in his own residence, he just mumbled: "Eh, you do not understand!" Bishop Hopko considered his death a homecoming. And the Heavenly Father finally called His faithful servant home on Friday, June 23. 1976. Bishop Hopko was beatified by His Holiness, Pope John Paul II, on Sunday, September 14, 2003, during an Apostolic Journey to the Slovak Republic.